Click on this box if you would like to view ALL 258 PICTURES from the Jazz at the Garden II Event. 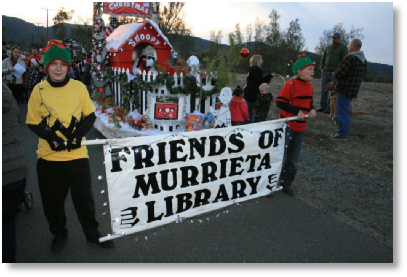 By doing so, you will be redirected to the Murrieta Public Library Foundation website where you can view and even save ALL of the photos taken at this event. 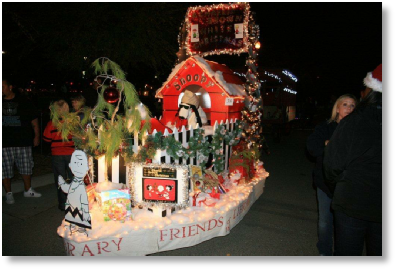 The theme for the Friends of the Murrieta Library’s 2nd prize entry in the 2012 Holiday Push Cart Parade was “Charlie Brown’s White Christmas”. Charlie Brown’s back yard featured Snoopy and his doghouse built by Ed Van Dorn. The yard was fenced by a handsome picket fence and festooned in lighted garlands of pine boughs with pine cones. 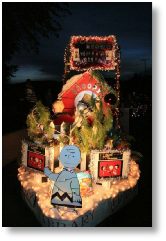 Charlie Brown graced the front of the float with his sad little Christmas tree that was cut from a Carson Ranch pine. Six smaller Charlie Brown trees were stationed 3 on each side of the float. Books, snow, two large side wooden trees and lights finished the scene. A total of 14 people participated in the Friends’ entry in the Push Cart Parade. Seven members planned and decorated the float. We had one planning session on November 5th and two scheduled workdays, thereafter. However, Ed Van Dorn spent many more work days in Carol Carson’s barn and at his home making sure that all of the lights, the snow and all of the decorations were in place and secure. The other float workers were: Carol Van Dorn, Carol Carson, Judy Call, Loretta McKinney, Ruth Zepeda, and Lela Llorens. 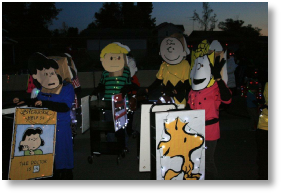 The Parade walkers wearing large “Charlie Brown” character masks were: Loretta McKinney, Kathryn Miller, Alex Miller, Logan Sedlacek, Gretchen Sedlacek, Sara Vert, and Declan McKinney. The riders on the float were: Natalia Blue, Tripp McBride and Chase McBride. The Banner Carriers were: Ian Johnson and Eric Johnson. The Push Cart Pushers were: Ed Van Dorn and Michael Sedlacek. 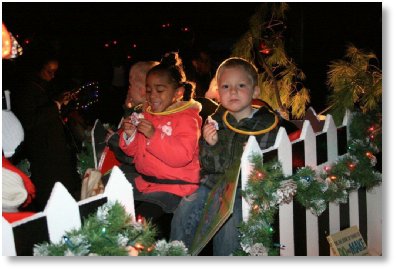 In addition to our thanks to all of the float and parade participants, the Friends wish to especially thank the Home Depot for a generous donation for materials to build Snoopy’s dog house and the fence and to the Corner Store for the many books used to decorate the float.